We treat a lot of heel pain or plantar fasciitis in our office. Many of the symptoms include pain when you first get up in the morning, burning, numbness and increased symptoms by the end of the day. 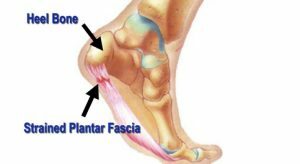 The pain is usually caused by tighteningof the plantar fascia ligament located on the bottom of the foot. The plantar fascia ligament supports the arch. When you're resting, the ligamentcontracts. As you start to walk, the ligament pulls and may tear slightly causing pain. Heel pain can also be brought on by trauma, over exertion, ill- fitting shoes or poor foot alignment. Proper foot support is one of the most important treatments we recommend. The purpose of foot support is to stop the ligament from tearing, thereby, getting at the cause of the problem. We often prescribe custom orthotics for the best possible foot support. Custom orthotics are inserts that fit into your shoes, which are custom moldedspecifically to your foot, to correct the faulty foot alignment and bring your foot into amore correct position. We find that most of our patients respond to conservative treatment with favorable outcomes. For those patients that require additional treatment surgery may be necessary. So, if you're suffering with heel pain, don't wait for it to become a chronic problem. Schedule an appointment today.